Bought this because of a allergy to down. Love it! Great size and it is bright white. Silky soft to the touch. Would buy again. Featuring super king and palatial king sizes, this alternative comforter is just about the largest size available. The PrimaLoft thermo polyester fill is not only hypoallergenic, but extremely comfortable, especially with the 400 thread count surface. Nice touches include delicate satin trim and our exclusive Perma Baffle construction that prevents shifting of the fill and the ensuing cold spots that create. Pima cotton is paired with a specially woven cotton sateen weave that is extra silky soft to the touch. Finally! A lofty, lightweight comforter that is big enough to overhang my king bed. This comforter is the down alternative and it can be machine washed. I have a tall four-poster with a 12" mattress on top of box springs. The porportions are such that it overhangs my king bed by a minimum of a 12 inches at the foot and 12 inches on each side. This is a HUGE comforter! No more winding up with no covers when hubby rolls over or raises his head of the bed to watch TV. The cover is a crisp white cotton with square baffles and is attractive enough to use without a duvet cover, though I purchased the Oversized Cotton Sateen Duvet Cover Set to go over it. The comforter is fluffy and lightweight. Not too warm for Texas in the summer--I keep my bedroom at 65 at night--but sufficient to keep you snuggly warm. Now I want one for all my guestrooms. I simply love it. This comforter had lumps within the squares where the cotton had bunched up. So afraid to wash it. Been looking for a comforter that actually covers my king mattress. The only option seems to be a bedspread which is 120" with not a lot of options for colors and design. Don't understand why vendors make king comforters, quilts, etc. that don't have enough size to cover the mattress. Excellent comforter to fill out our king duvet! We needed something to fill out and large enough to over lap the bed- this is it! Haven't washed it yet but so far so good. Light fabric/fill. We have a blanket under for cold winter nights. Really, really big and so warm! I bought the palatial king size and it is both wide and long. No more middle of the night battle over who gets his/her share of comforter :) The loft is high and does not shift so it provides even warmth over the entire bed; best for cold winter nights. The 118" x 114" dimensions, however, make finding a duvet cover almost impossible. I will be making one out of oversize king sheets since I like the cleaning convenience and protection that a cover provides. The PrimaLoft 400 Thread Count Down Alternative Comfortoe with Oversized Options is a great bedding piece for all the seasons except summer. The size and feel are exceptional to cover the entire bed with a nice overhang that covers our tall mattress and full sized boxspring. I'd like to buy more and give them as gifts for my family to enjoy as well. Love the size of this! Looked everywhere for an oversized King comforter that would fill a king duvet - and I finally found this one! Huge and comfy warm. Recommend for sure! I searched many sites for a comforter large enough for my 80-inch wide BIG and TALL bed. This supersize fits perfectly halfway the bed side-rails! The only negative is it is so big I am unable to adequately fluff the down alternative in it. The size, however, is much more important to me than the fluff! Definitely recommend!! I am extremely happy that I found this oversized down comforter that actually fills up my duvet. I purchased the standard size in times past and had quite a bit of duvet with no filling. This down comforter fulfilled all my expectations and then some as it is the perfect size, weight, and comfort level for these cold winter months. Great size and super comfy! Our old King duvet did not fill out our duvet cover. I was looking for a big one to fill out the California King duvet cover and I found it. My husband and I will not longer be fighting for warmth! Plus, it is extra plush and comfy!! The description is perfect for this comforter - PALATIAL. It is very soft & extremely fluffy. I have a King bed & I finally found a comforter that fills up my duvet cover. I highly recommend & you can't beat the price! I love it but after owning it for a short amount of time the down alternative in each square bunched up together in each square,it never was put in the dryer & for the price I paid I don't think it should do that. I wish I could still use it but it's worthless now. I would buy another one if I knew it wouldn't do this because everything else about it is amazing i.e. the size,the comfort,the warmth of it but doesn't make you to hot. Came quickly and feels amazing. It covers all sides of my over sized king bed. We live in Az and it does get hot here. The comforter gives enough coolness to a hot night. We love this comforter! It actually washes up very nicely, too. We have a front-loading washing machine with a large tub. Would not recommend the dryer. Absolutely LOVE this and worth every cent! With this oversized comforter you do not have to worry about the sheet hanging lower. Covers nicely. I fold it back and put the pillows on top. Use year round, nice weight and feel. You won't be disappointed with this comforter. Love the size of this comforter! I have a pillowtop mattress, and downlite's palatial king is the ONLY comforter that is big enough to cover the sides and bottom of the mattress. I highly recommend this comforter. 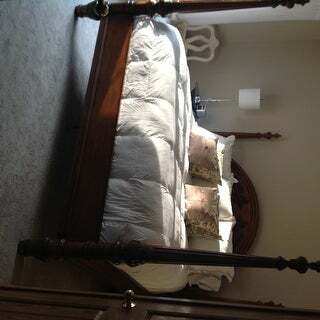 I have a high, traditional four poster bed, and wanted an oversized comforter that would cover much more than just the top of the bed. It has held it's loft over time, even after washing, and is nice and warm during a cold New England winter. Very comfortable and light. Just right for Miami air conditioning. Very satisfied with the purchase of this light comforter. I live in Southern California so the weight of this comforter is perfect. Keeps me warm on cold nights. Great comforter for the price. Same high quality as comforters that are double the cost. I liked it so much that I also purchased one for the guest room. Great size to cover a Cal-king bed. Lightweight. Like the cotton exterior! Warm enough without the weight. Haven’t needed to wash it yet. Hope it retains its integrity. I originally bought this comforter in 2016. I just went through great efforts to buy another because we love it so much. It’s the only comforter that seems big enough in width to where my husband and I aren’t playing tug of war with it. I bought a new one because it was stained. It’s always a challenge to keep white clean. If it wasn’t for stains, i wouldn’t have needed to purchase another. It was in great shape. I also put it in my fort in loader for washing a number of times. Had an issue and the one that I received is defective and is not sewn completely shut. Contacted Overstock customer service and another one is on the way and I will be returning the defective one. Seems very soft and very comfortable and I am still glad I made this purchase. Thanks for the fast response Overstock.com! So big and fluffy! Great quality exterior material also! awesome pricing and beat out all the companies that have those catalogs with home goods and comforters! "Is the material a very soft cotton or does it have that sheen and sound when moved...if that makes sense?" Yes it is very soft and should not sound crinkly. 400 Thread Count Cotton shell is utilized. "When will the larger king sz comforter become available ?" These are likely 30-45 days out in the larger sizes. Currently only the Oversize King is available. "Is this a comforter or do I need a duvet cover? Also, do you have matching pillow shams?" "Do the corners have fabric in order to tie the duvet cover to to keep the comforter in place?" It does not come with ties. I am in the process of adding some ribbon and doing a few stitches by hand to make the ties. "Does this have any inside duvet securement options?" "I cant seem to find a duvet cover for this palatial king - do you sell any that will fit this 118*114 comforter?" I bought the Oversized Microsuede Saddle 3-piece Duvet Cover Set for mine and it fits perfect! The size of the comforter doesn't need to match the size of the duvet cover. If the dimensions are larger it just means that your duvet will look more filled and puffier. If you get one that matches the dimensions exactly it usually looks skimpy. That is the beauty of an oversized duvet insert comforter. thermo polyester fill is not only hypoallergenic, but extremely comfortable, especially with the 400 thread count surface. Nice touches include delicate satin trim and our exclusive Perma Baffle construction that prevents shifting of the fill and the ensuing cold spots that create. Pima cotton is paired with a specially woven cotton sateen weave that is extra silky soft to the touch.